In this model equation , , and are the coefficients of the quadratic segment, and c is the plateau of the mean function. The NLIN procedure can fit such a segmented model even when the join point, , is unknown. We also want to impose conditions on the two segments of the model. 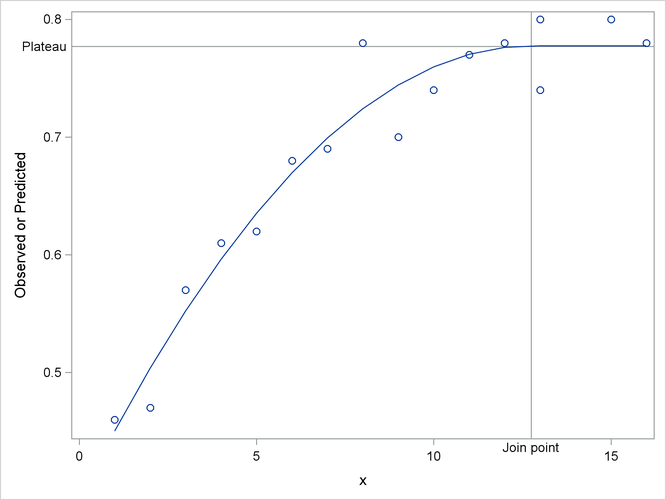 First, the curve should be continuous—that is, the quadratic and the plateau section need to meet at . Second, the curve should be smooth—that is, the first derivative of the two segments with respect to x need to coincide at . Although there are apparently four unknowns, the model contains only three parameters. The continuity and smoothness restrictions together completely determine one parameter given the other three. The parameters of the model are , , and , respectively. They are represented in the PROC NLIN statements by the variables alpha, beta, and gamma, respectively. In order to model the two segments, a conditional statement is used that assigns the appropriate expression to the mean function depending on the value of . A PUT statement is used to print the constrained parameters every time the program is executed for the first observation. The OUTPUT statement computes predicted values for plotting and saves them to data set b. The results from fitting this model with PROC NLIN are shown in Output 67.1.1–Output 67.1.3. The iterative optimization converges after six iterations (Output 67.1.1). Output 67.1.1 indicates that the join point is 12.747 and the plateau value is 0.777. The analysis of variance table in the reparameterized model is the same as in the earlier analysis (compare Output 67.1.5 and Output 67.1.3). Changing the parameterization of a model does not affect the fit. The “Parameter Estimates” table now shows x0 as a parameter in the model. The estimate agrees with the earlier result that uses the PUT statement (Output 67.1.2). Since is now a model parameter, the NLIN procedure also reports its asymptotic standard error and its approximate 95% confidence interval.